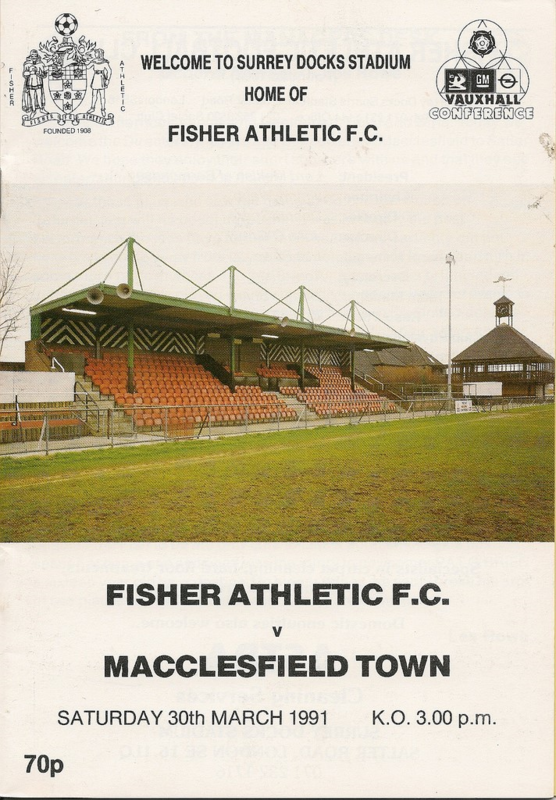 Since arriving at the summit of non-league football, three seasons earlier, Fisher Athletic had found the going tough. Previous climbs to a new level had often seen the Fish immediately prosper and set the pace in their new surroundings, but the General Motors Conference League had proved a far harder affair. Lower mid table finished had become the norm and the threat of relegation had been omnipresent. The 1990-1991 season started with Mike Bailey at the helm, having taken over the previous November following the departure of charismatic manager Malcolm Allison. The big signings promised in that era had failed to materialise and it was more of a journeyman squad that Bailey took into the start of the season having successfully battled relegation in the previous term. 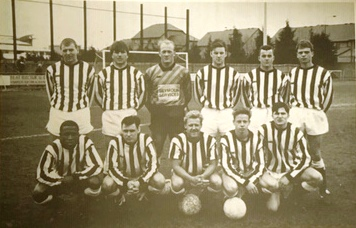 Despite the poor run, Bailey’s original 12 month contract was extended and with funds made available for strengthening by the new board he immediately set about upgrading the squad, bringing in six new players including Jimmy Quinn, former Cambridge and Portsmouth forward Alan Biley, and ex-Crystal Palace stalwart Jerry Murphy. The investment yielded little return. A further heavy defeat at Merthyr, where seven goals were conceded without reply, occurred before Christmas and that signalled an end to Bailey’s short lived reign. Club stalwart Dennis Sharp was tasked with the job of keeping Fisher amongst non-league’s elite. The cup campaigns had seen little respite for the beleaguered club through the Autumn and early Winter. Early exits were made to lower league clubs in both the FA Cup and FA Trophy. Harwich and Parkeston of the Eastern Counties league sent the Fish tumbling out the FA Cup in the first qualifying round. Despite home advantage for the replay following a 0-0 draw at Salter Road few gave the Essex outfit a chance in the replay but they completed the giant-killing act with a 2-1 win. Redbridge Forest extinguished FA Trophy hopes in the first round after Harrow Borough had been overcome in qualifying. The Bob Lord Trophy and Kent Senior Cup also saw early exits and by mid-January only league survival remained as a target for Sharp to aim for. The 293 present at Layer Road to see Colchester United knock the Fish out of the Bob Lord Trophy remains the lowest attendance for a competitive fixture for Colchester. Whilst Sharp’s appointment was well received by the fans, it was February before the new boss was to see his charges pick up three league points when beating Yeovil Town 1-0. Oddly Yeovil had been the opponents for the side’s last league victory way back in October. Sharp shuffled the pack and brought in David Ward and Ricky Pearson in an attempt to shore up the defence in front of keeper Paul Bastock. No one would have guessed Bastock would still be playing senior football some 27 years later, in doing so setting a new British appearance record. Ron Victor and Steve Restarick were also signed in a last throw of the dice to add some guile up front, but whilst several credible draws were obtained away at Cheltenham Town, Macclesfield Town and Altrincham, and the once heavy defeats were now often only by a single goal, the wins were still few and far between. A home 1-1 draw with Welling United on 22nd April consigned Fisher back to the Southern League. However the season was still to end in dramatic fashion. A two way title race had been contested through the spring between Colchester United and Barnet with the final day of the season seeing Barnet visit Salter Road. A record crowd of 4283 packed the stadium primarily decked out in gold and black but Fisher shocked the expectant visiting fans by twice taking the lead. With Colchester cruising into a two goal lead in their game, with half an hour to go the title seemed be heading to Layer Road. However a Barnet equaliser was followed by two late goals two ease the tension and saw Barry Fry cavort across the pitch with an army of Barnet fans as Fisher Athletic waved goodbye to the Conference. Little did anyone know how long the wait to return would last.